What Do you Call Your Half Sibling? 9. We know how to get around that “I’m saving for a rainy day” syndrome, when your folks are drowning in their problems. 8. We’re much cheaper than the cost of plane fare if you have to fly into town when your parents say “everything is fine” but you know it isn’t. 4. We’ve helped hundreds of families a lot worse than yours. 3. Your dad can’t push our buttons. 2. Next time you want to hang up on your mother, you can tell her to call us. 1. We’re available 24/7, so you don’t have to be. Summer is here and many midlife siblings and their own family of young siblings are bound for Grandma ‘s house. Before you go over the river and through the woods, call a geriatric care manager in their area. You can find one of the National Geriatric Care Management site by just adding your Mom’s zip code. Make an appointment to go to their office and meet with them, during the visit to your aging parents. Most GCM’s will see you to discuss their services at no charge. You can shop around and interview a few if you wish. Why do that before you go over the river. Well there just may be a flood in your future and a wolf in your woods. Calling a geriatric care manager is a preventative and prudent step. If you to have a geriatric care manager in the town where your older relative resides, they build dams and scare off those wolves. If there is a crisis with grandma, it is cheaper to have a local geriatric care manager solve the problem. When you get the dreaded call about a fall or hospitalization, you have to fly or drive to grandmas. The geriatric care manager is minutes away and can get there immediately- like a first responder in an ambulance. In an urgent situation, they can go to the hospital or emergency room. This is more sane and cost effective than you getting on last minute, expensive flights or driving hundreds of exhausting miles. You can still go to grandpa or grandmas but the geriatric care manager can immediately be there to deal with the crisis. They are good insurance. 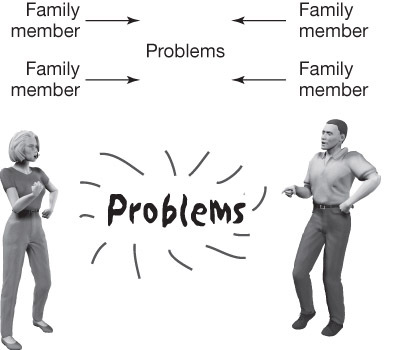 So before the family reunion, your, summer vacation, or labor day come and go- call a geriatric care manager so that your Mom or Dad are have a geriatric care manager to stave off or solve any crisis, so you don’t have to face a bigger messier problem your aging parent is safe, and you have PEACE OF MIND. 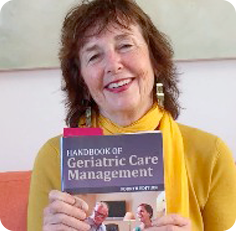 In 2011,I published the 3rd edition of the Handbook of Geriatric Care Management.Jones and Bartlett. This book is called the bible of the field of geriatric care management The book is a comprehensive guide for Geriatric Care Managers (GCMs) to help define duties and procedures while providing guidelines for setting up a geriatric care practice. An essential teaching tool, this new edition is an easy-to-use, practical guide that gives students the foundation they need to receive a certificate or degree in GCM. The Third Edition has been completely updated with revised chapters on psychosocial assessment, functional assessment, ethnic and cultural assessment, and writing a geriatric assessment. Also included throughout the text for additional study are sample forms, sample letters, and case examples. Now if you are an existing geriatric care manager, want to start a geriatric care management agency or a non-profit or for profit consortium of services and want to add a profit center like geriatric care management to your mix, or are a home health agency and would like to add geriatric care management, I will have a new Operations Manual, My Geriatric Care Management Operations Manual, out soon to show you step by step how to operate a geriatric care management agency. My Geriatric Care Management Operations Manual covers initial consultation, completing a contract, on call procedures writing a geriatric assessment and nine geriatric care managements service or products and steps by step how to offer/sell the and deliver them. The manual also contains over 100 forms to go with each service. It will be up on my web site soon.